GR2 is having a benefit show tomorrow (Saturday!) and I have some little pieces in it. The theme of the show is robots. This was difficult for me: there are a lot of things I'm not good at drawing (folds, muscles, dogs) but drawing robots I'm actually kind of phobic about. 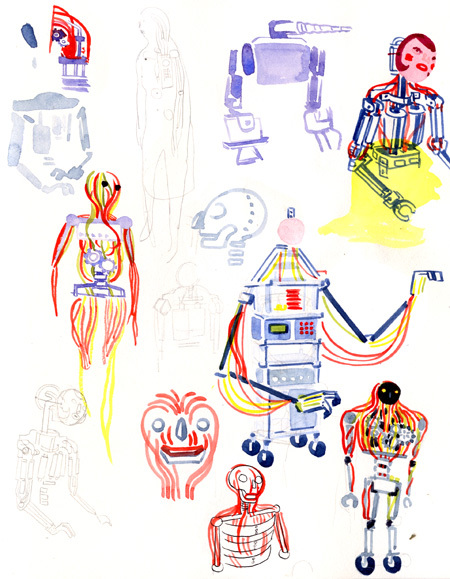 I thought this might be a chance to work through my phobia by proving to myself that I really can draw robots. But guess what! I actually really, really can't. Finally, I gave up and drew people with tubes and wires sort of coming out of their necks. Whew! Crises averted! You should check out the show if you can; I sure do like GR2. Oh my goodness, Amazing work! I hope someone doesn't buy all of them and you put them online afterwards! I want one! Thanks Benjamin! I donated the work to GR so I won't get it back, but they usually put artwork from shows online as well, so you could keep an eye on the GR2 site for it! Wee! I have one of your post its in a frame on my wall so it would be great to start a collection for when you're super famous! dude, can totally draw robots.